To be honest, Milhouse and I had visited Gourmet Castle a little while ago; but for some reason or another, I didn't feel like doing a post about it. Maybe it wasn't all that interesting? I've actually been here many times in the past before it had changed hands (more than once). 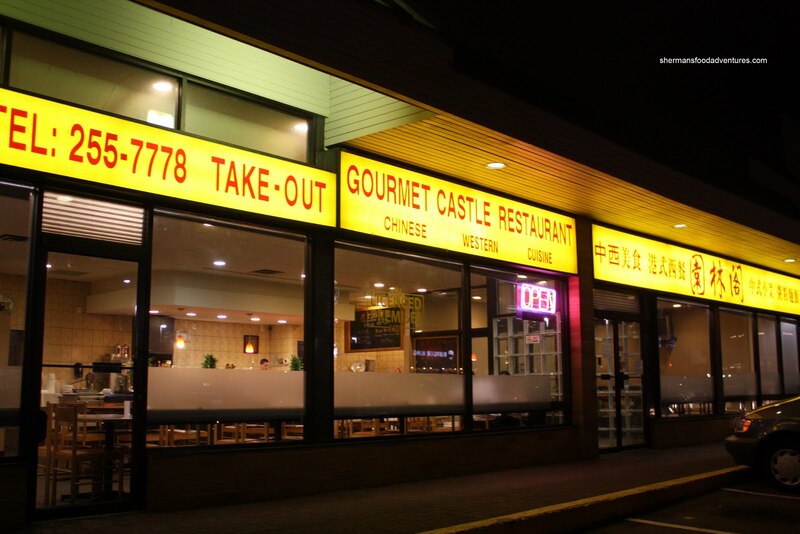 The food here was never the big draw; rather, it filled a void for late night eats. So now I've decided to write a post because we paid a return visit recently with the hockey team after Friday hockey. Fate would have it, we ordered some of the same dishes again. I guess we can see if they are consistent, whether it be good or bad... Okay, the real reason we chose Gou rmet Castle was due to the immanency of snow. None of us wanted to go real far if we had to navigate through the first snowfall of the year. When we arrived, it was almost too funny that there were no Asians in the restaurant despite it being a Chinese joint. Meh, it didn't matter to Milhouse and I. We eat anything. Moreover, the food was actually acceptable the last time we ate here. In fact, Milhouse ordered exactly the same dish as last time. Guess what it was? 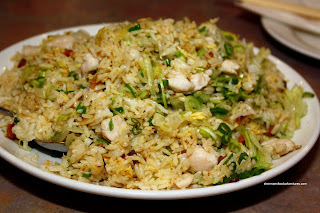 If you guessed Salted Fish & Chicken Fried Rice, you hav e been reading this blog too much... LOL... 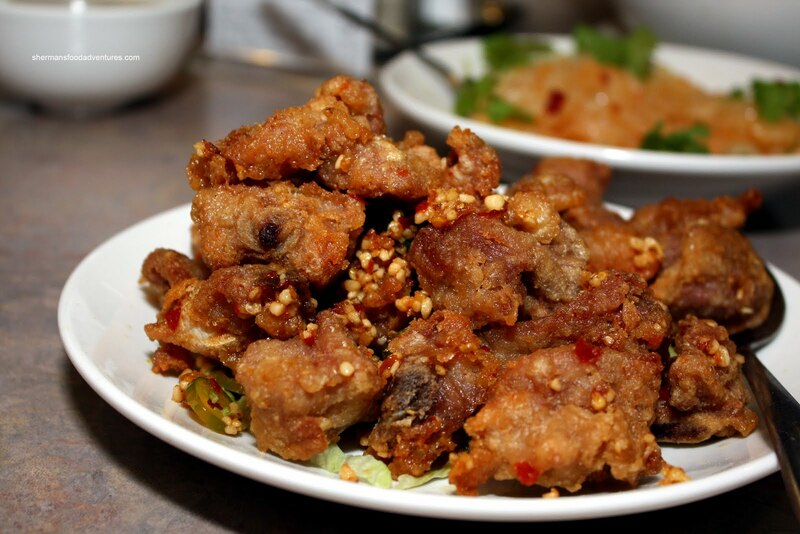 The first time we had it, the rice had a nice chewy texture and the entire dish was not oily. A good amount of tender chicken and crisp lettuce as well. One problem - the salted fish was dry and didn't provide enough flavour to the dish. This time around? Same thing. So at least they are consistent. Gordo ordered the Curry Brisket on rice, which I had last time. For the price, this is a substantial amount of food. 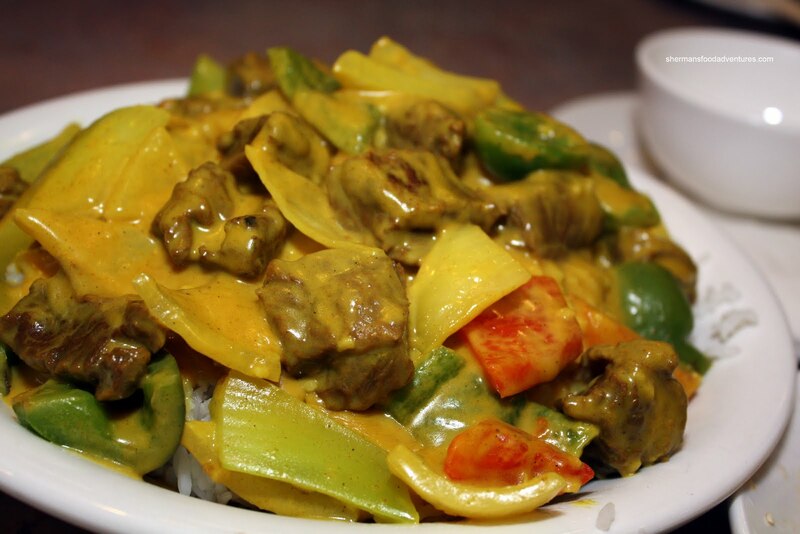 The Chinese curry was typically not spicy and slightly sweet. Knowing this, it was decent. Lots of tender brisket and veggies to go along with the sauce. And just like last time, there was just not enough sauce for the rice. Once again, consistent (whether it is good or bad). 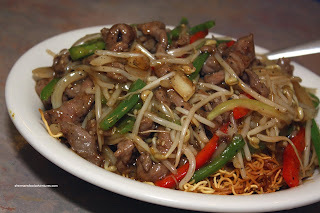 Bear went for the Black Bean Chicken Chow Mein. Much like the curry, it was overflowing. Really large portion. For me, it didn't look so good; but Bear assured me that it tasted better than it looked. He opted for the fried noodles instead of the soft version. The noodles were crispy and not too oily; however, he didn't like how they cut them into small pieces. Hard to eat. For some reason or another, Sweet Tooth had a plate of Salt & Pepper Dry Ribs. Pretty normal as a appetizer at say... Cactus Club; but kinda weird in a Chinese restaurant. To think of it, I guess it is only a matter of perception. Nothing amiss with this dish, pretty standard. While everyone was enjoying their own plate of food, Boss Woman, Polka King and myself shared the Dinner for 3 (with choice of dishes, complimentary appetizer, daily soup and rice). 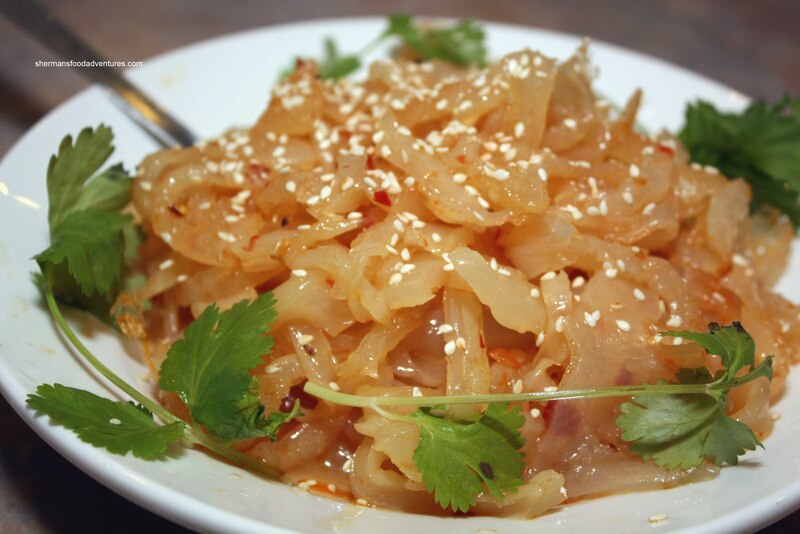 For our appetizer, we opted for the Jellyfish rather than the Empress Chicken. We particularly liked the nice "snap" in the nicely-sized strands of jellyfish. However, I felt that it would have benefited from more seasoning, in particular, salt and/or soy. There was no need for anything else since there was enough sesame oil and chili flakes. Portion-wise, this was more than enough for 3 people. 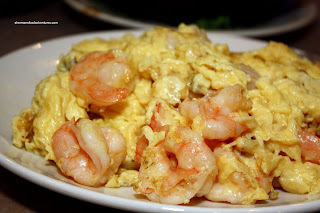 For our first main dish, it was almost a given it would be the Scrambled Eggs and Shrimp. Both Boss Woman and Polka King love this dish. In fact, I believe that Boss Woman could live on this alone. The dish here was pretty good and extremely large. If you think I posed the shrimp so it would make for a good picture, think again. This was consistent throughout the dish. Lots of big shrimp (more like prawns) nestled within the mostly fluffy scrambled egg. I say mostly because it could've been cooked just a smidge less. The large shrimp were fantastic being crunchy and sweet. 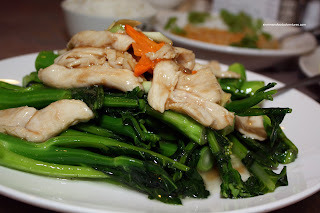 Trying to eat a bit healthier, Polka King suggested we order the Gai Lan with Chicken. 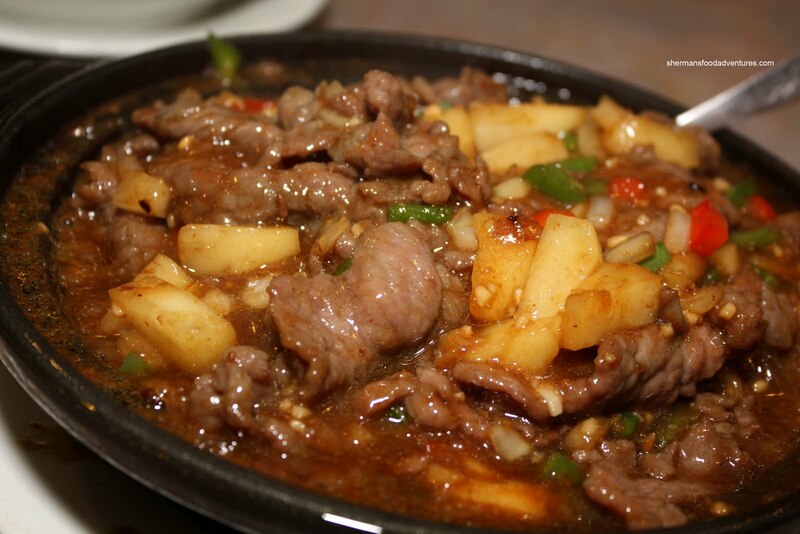 Typically, this dish has sliced tender beef or seafood rather than chicken slices. Despite the apparent healthiness of sliced chicken breast, I much prefer beef since it has a much stronger presence. With that in mind, the gai lan was still cook ed correctly. It was crisp and just barely cooked. Good colour and texture. The dish could've used a bit more seasoning; but it wasn't a big deal. Now the next dish was a venerable explosion of flavour. My choice of dish was the Satay Beef Vermicelli Hot Pot. With a good amount of satay, pineapple, peppers and onions, there was a mix of spicy, sweet, savoury and acidity which made for some tasty vermicelli underneath. It arrived bubbling hot with lots of tender beef. Once again, this was a very large hot pot, more than enough food for 3 people. The meal for 3 cost us $36.00 before tips and taxes. Not exactly cheap; but considering the portion size and that the food was actually decent, we felt it was a good value. It's interesting that I hesitated to blog about this place. I suppose it has a lot to do with my past experiences here, which have been less than stellar. Sure, the food is still hit and miss; but there are some good items to be found here. If you order the right stuff, it can actually be satisfying for a reasonable price. And really, that is all we can possibly hope for when there is not much else open at 3am in the morning. Anson, did you mean the Urbanspoon link? Not sure what you meant.